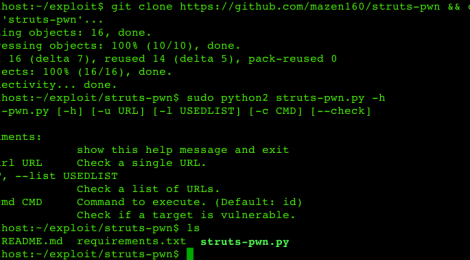 Browse: Home / struts-pwn ~ An exploit for Apache Struts. This project is made for educational and ethical testing purposes only. Usage of struts-pwn for attacking targets without prior mutual consent is illegal. It is the end user’s responsibility to obey all applicable local, state and federal laws. Developers assume no liability and are not responsible for any misuse or damage caused by this program. struts-pwn is An exploit for Apache Struts CVE-2017-5638. Checking if the vulnerability exists against a list of URLs. ← Invoke-Obfuscation v1.7 – PowerShell command and script obfuscator.